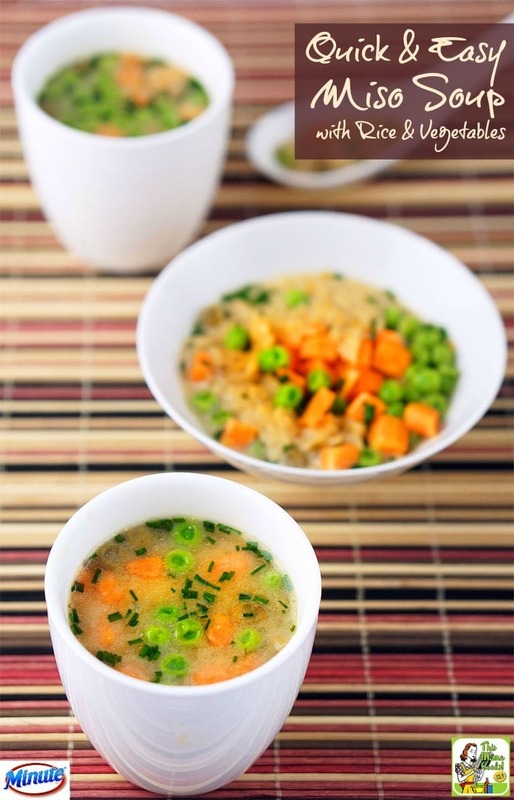 When I created my Quick & Easy Miso Soup with Rice & Vegetables recipe, I wanted to come up with a basic miso soup recipe that my kids could make on their own. They love making instant miso soup from a mix, but I wanted something more wholesome but just as easy. So when Minute® Ready to Serve Rice had me develop a recipe using one of their instant rice products, I thought it would be ideal. How do I make easy miso soup? First, you need some miso! Miso is actually fermented soybeans and it comes in a variety of forms – white, red and mixed. It’s available at most Asian markets and probably at your local health food store, too. What I love about it besides it’s salty-sweet taste (called umami) is that it’s so versatile. You can, of course, use it in Quick & Easy Miso Soup. But it’s terrific in stir fry, in a glaze for chicken or fish, and in a salad dressing. Since I wanted to make this miso soup recipe a bit hardier, I needed to add something to the soup besides vegetables. Leftover rice would be ideal, but we don’t always have that in the refrigerator. And it takes to long to make a batch of rice. That’s why Minute Ready to Serve Rice is perfect. You just heat up an already prepared cup of Minute Rice in the microwave to add to this easy miso soup recipe while you’re heating up the soup. Easy enough for an older child to do by themselves! Buy several to Minute Ready to Serve Rice varieties to try, since it’s a yummy addition to lunch on the go since you can heat and eat it straight from the cup. It’s also perfect for kids’ school lunches, assuming they have a microwave in the school cafeteria. Finally, try it for a quick breakfast meal or snack. Heat and add some milk, raisins, and a dash of cinnamon. 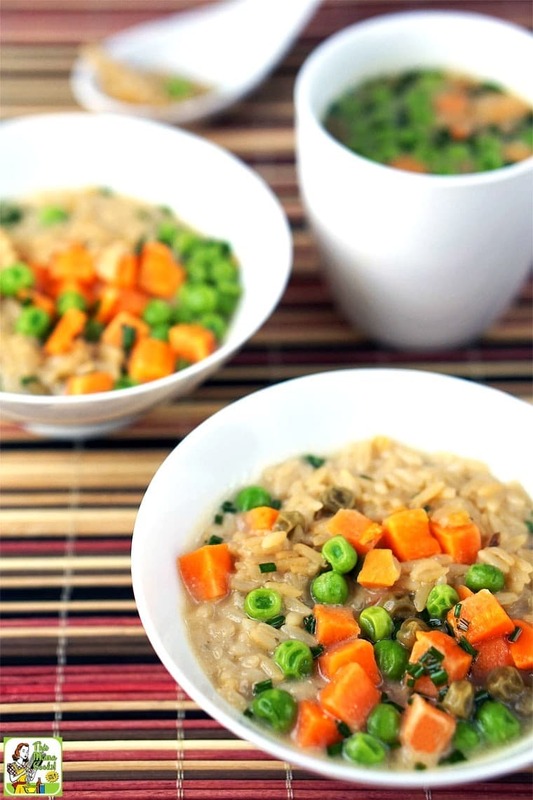 A wholesome rice dish that’s easy for the kids to eat on the way to school or sports practice. The miso soup recipe portion size is for 2 – or one very hungry teenager. If you’re just making soup for yourself and don’t want leftovers, halve the recipe. I used white miso for this homemade miso soup recipe. But red or mixed miso would work well, too. I always have bags of peas and carrots in the freezer to add to mac and cheese or other dishes. Not to worry if you don’t. Instead, use any other frozen vegetables cut into small pieces that you like. There’s no need to defrost the frozen vegetables. Just add to the miso soup ingredients as directed to heat up. If you don’t have fresh chives in the garden like I do used dried chives or substitute thinly sliced green onions instead. You may wish to add a protein to this basic miso soup recipe. Some ideas would be slices of hard boiled egg, or pieces of tofu. If you have leftover chicken, pork or beef from the previous night’s dinner, cut the meat into small pieces and add to the miso soup recipe. 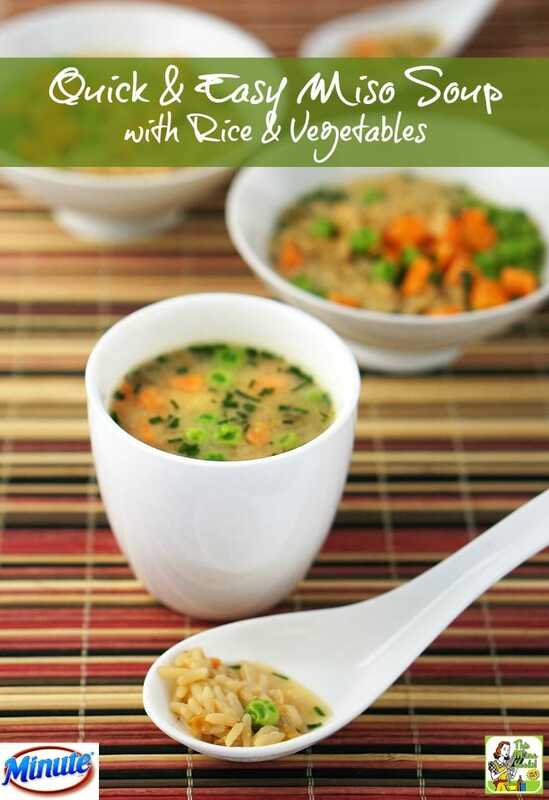 Quick & Easy Miso Soup with Rice & Vegetables can be served in bowls or in mugs. Place water and miso in a small saucepan over medium high heat. Use a spoon to break up and mix miso into the water as it heats. Bring to a boil and lower heat to medium low. Add frozen peas and carrots and chives. Add two already heated in the microwave Minute Ready to Serve Rice cups. Stir to break up any clumps of rice. Posted in Gluten Free, Recipes, Soups and tagged rice on September 20, 2016 by Anne-Marie Nichols. This was super good and super easy. I made it with their boil in bag brown rice. Light on flavor, so I add some liquid aminos to my individual portions. Great to hear that it works well with brown rice, too, Tasha!